Bwindi Impenetrable In the local Lukiga language Bwindi means 'impenetrable'. This double warning is suitable and applicable to this Africa's most ancient rainforest of tangled vegetation draped over a deeply fissured landscape of steed, slippery valleys and high draughty ridges. It lies 530km from Kampala, in the south – west of Uganda in Kibaale district close to the Democratic Republic of Congo border, the park covers 337sq km and encompasses one of the last remaining habitats of the mountain gorilla, where half of the world’s surviving mountain gorillas live. Bwindi Forest is a safe haven for gorillas, colobus monkeys, chimpanzees and lots of birds like hornbills and turacos. The park is principally notable for gorillas, where half the world's population of the endangered Mountain Gorillas is found. 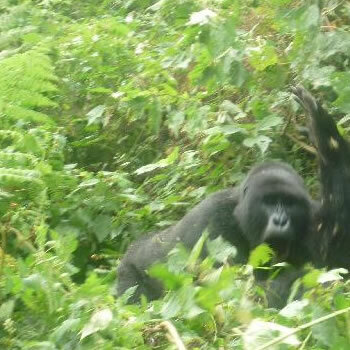 There are four habituated Mountain Gorilla groups open to tourism; Mubare, Habinyanja, Rushegura near Buhoma and the Nkuringo group at Nkuringo. The biologically diverse park derives its names from the local language ‘Bwindi’ (dark place) which defines the impenetrable nature of its thick forests. In 1994, it was accredited as world Heritage site. The word Bwindi means Impenetrable and what makes Bwindi Impenetrable is the fact that it has twisted vegetation wrapped over an intensively fissured backdrop of the sheer, draughty ridges as well as the slippery valleys and hills. The park has a big population of gorillas and is renowned for its coldness in the morning and at night. The coolest months are usually June and July and the average temperature is about 70c-200c. This is the reason why for safari purposes, one should come with warm clothes because Bwindi is so cold and receives about 2390mm of rain. It has two rain seasons, little rains are in the months of March-May and heavy rains are in the months of September as well as November and the rain in Bwindi forest lasts for longer hours. Kampala-Kibaale (414Kilometres, between 5-7 hours), then Kabale-Kanungu- Kanyantorogo - Buhoma Park Headquarters, about 120kms, a 3.5hour-drive. Kampala-Kabale (414Kms), then to Ruhija and finally to Buhoma which is 95 kilometres, a three-hour drive. Animal species in Bwindi Impenetrable Forest: (a) Gorillas, it's a home for over 360 gorilla beringei, a half of the total remaining world population. (b) Monkeys for instance Hoest's, red-tailed and blue monkey, black and white colobus. 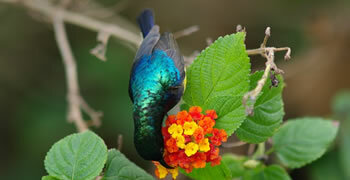 (e) Over 346 species of birds registered (Bwindi has 90% of all Albertine Rift endemics. (g) Mammals i.e. buffaloes, leopards, elephants and many more.